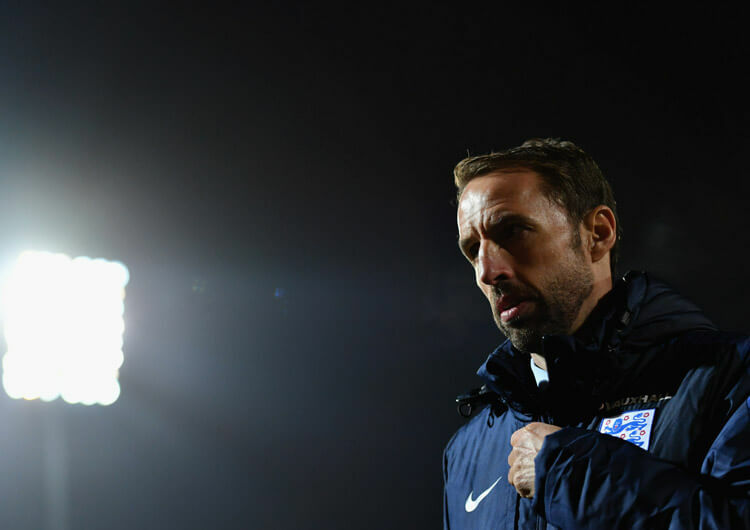 A late penalty, awarded by the video assistant referee (VAR), denied England a win in this international friendly against Italy at Wembley Stadium. A powerful strike from Jamie Vardy had deservedly put the Three Lions ahead in the 26th minute, after Jesse Lingard’s quick free-kick, and they looked worthy of the win before drama in the closing stages. Following a tangle between James Tarkowski and Federico Chiesa in the box, the referee consulted VAR and pointed to the spot, with Lorenzo Insigne stepping up to equalise in the 87th minute. Here, our professional coaches look back on the action, dissecting the tactics and key moments. 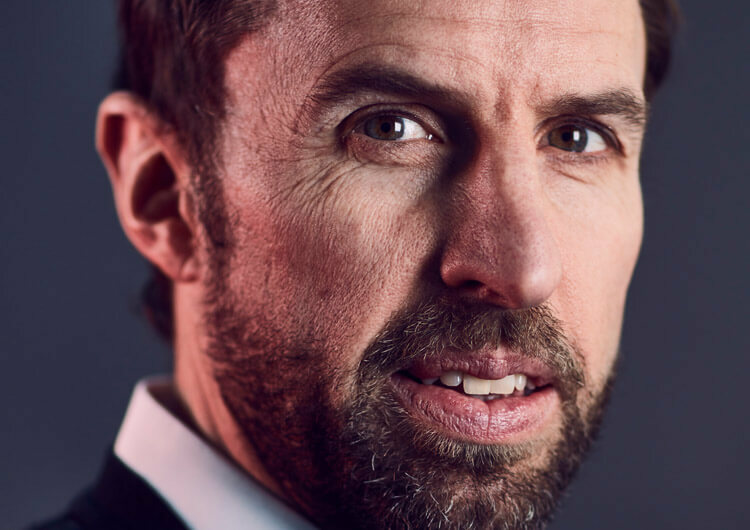 England started in a 3-1-4-2 formation with Eric Dier sitting in front of the back three, switching to a 5-3-2 in defence – an increasingly familiar set-up under manager Gareth Southgate. 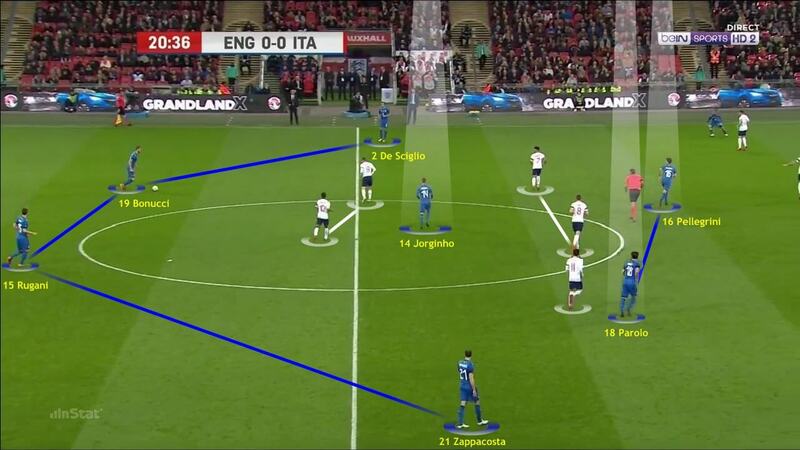 Whenever Italy tried to play out from the back, England’s front line pressed high up the pitch through Jamie Vardy and Raheem Sterling. They sometimes allowed the visitors to pass to their central midfielders by standing off them in the middle of the park, but the home midfielders showed a strong desire to intercept in these areas and shield their defensive unit. 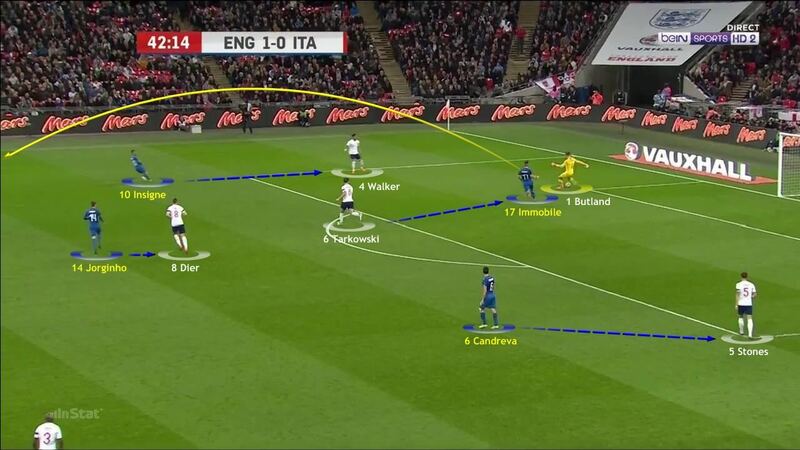 In front of their own goal, England’s back five showed impressive concentration, co-ordination and communication. The Italians nonetheless posed problems in the final third when players such as Ciro Immobile, Lorenzo Insigne, Marco Parolo and the substitutes Federico Chiesa and Andrea Belotti looked to break through the gaps and in behind the defence. It was an area in which the visitors were able to threaten. 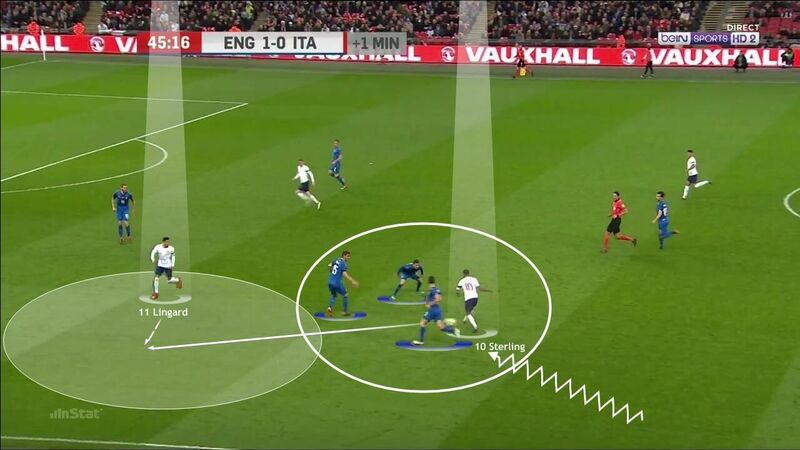 England also had problems with the wide play of Italy, where they gave Mattia De Sciglio and Davide Zappacosta the time and space to get forward. 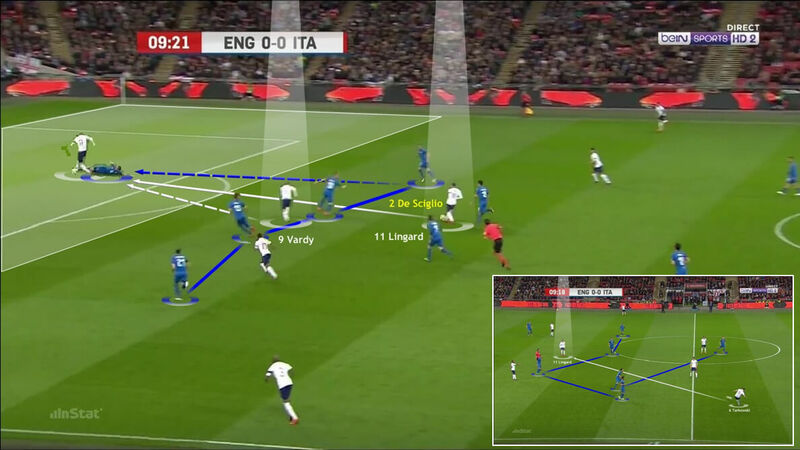 The full-backs’ link-up play with their forwards, notably Insigne and Chiesa, constantly kept England’s wing-backs Kieran Trippier and Ashley Young on their toes. In the attacking phase, both goalkeeper Jack Butland and the three centre-backs were active participants in the build-up play. Their intention was promptly to beat the first line of pressure to supply their teammates in space. Eric Dier, Jesse Lingard and Alex Oxlade-Chamberlain always made themselves available to try and establish England’s control of the midfield. The Three Lions’ midfielders favoured through balls in behind the defensive line or long balls straight to their strikers. Their players were constantly trying to lose their marker and break free from the back four, causing defensive imbalances for Italy in the process. Raheem Sterling had a particularly effective game from start to finish. His movement and ability to draw in defenders with his dribbling proved hugely beneficial for his attacking teammates. Sterling led the charge in constantly attacking the space or, when none was available, looking to take up shooting positions. 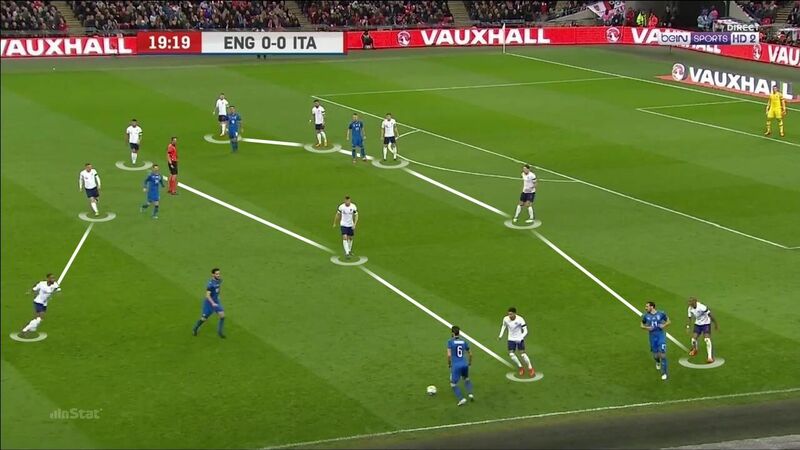 England looked to facilitate crosses from the flanks and caused plenty of problems from set-pieces, where players like Kyle Walker or John Stones dominated their Italian opposite numbers in the air. They also made effective use of a quick free-kick after a foul on the edge of the area, with Jesse Lingard playing in Jamie Vardy for the opening goal. Finally, England found themselves in plenty of favourable positions on the counter-attack thanks to the speed and calibre of their attacking players – particularly Vardy, Lingard and Oxlade-Chamberlain. They were very dangerous in this phase throughout the game, with their breaking runs into space and in between the midfield and defensive lines. 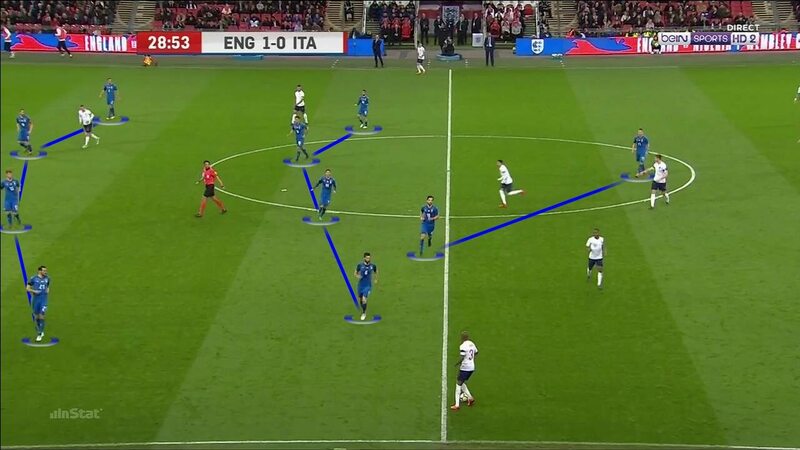 Gareth Southgate’s England side started in a 3-1-4-2 formation, switching to the 5-3-2 pictured here in defence. Italy posed England problems in the final third, with Ciro Immobile, Lorenzo Insigne, Marco Parolo or substitute Andrea Belotti looking to break through the gaps and in behind the defence. 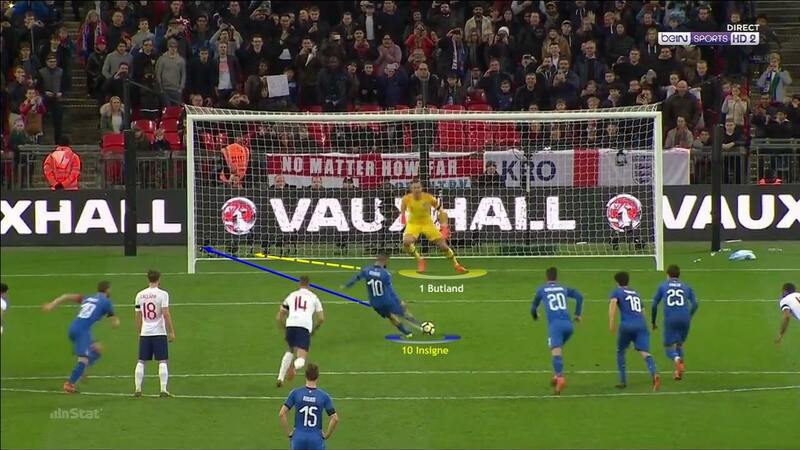 England’s midfielders favoured through balls in behind the defensive line or long balls straight to their strikers. Their forward players constantly tried to lose their marker and break free from the back four, causing defensive imbalances for Italy in the process. Raheem Sterling impressed for England throughout. His movement and ability to draw in defenders with his dribbling created space for his attacking teammates. England were a threat from set-pieces. This image shows how they made effective use of a quick free-kick after a foul on the edge of the area. Denying Italy the chance to make a wall, Jesse Lingard caught the visitors off guard and played in Jamie Vardy to grab the first goal. Interim Italy head coach Luigi Di Biagio adopted a 4-3-3 formation, dropping to a 4-4-2 or sometimes a 4-4-1-1 in the defensive phase. 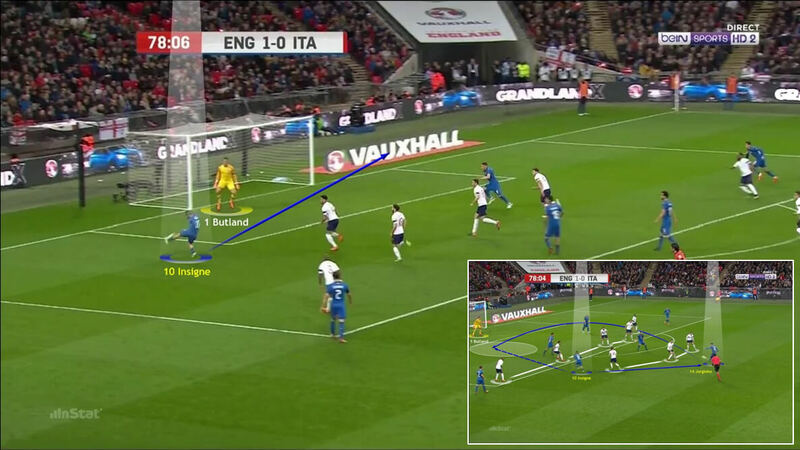 Italy pressed high up the pitch, hoping to force the England defence to go direct and discouraging them from passing short through the middle. Jorginho, Marco Parolo and Lorenzo Pellegrini showed a great ability to adjust their position depending on where their team wanted to develop the attack. 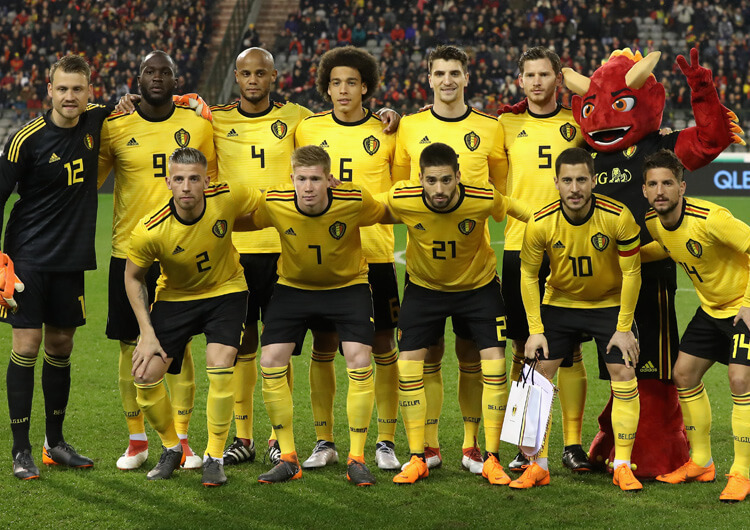 Jorginho operated in behind the English strikers, while the two other members of the Italian midfield positioned themselves behind their England counterparts. 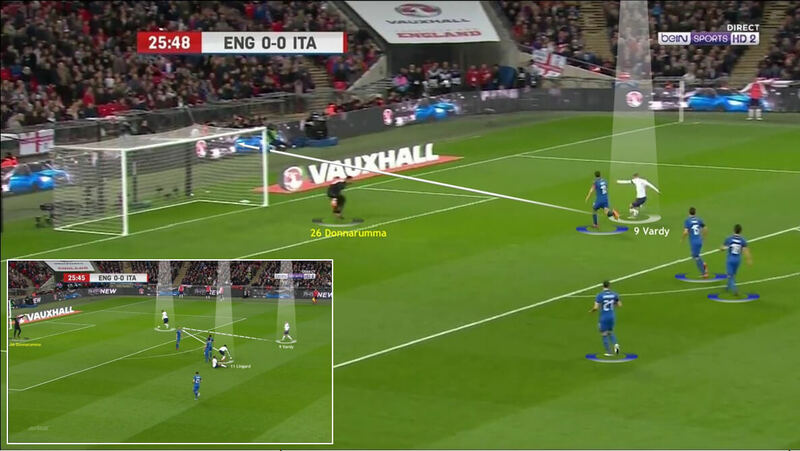 Italy’s movement on the flanks created problems for the hosts, especially on the left wing defended by Ashley Young. The visitors offered a greater threat in these areas as the game wore on. VAR took centre stage in the closing minutes, as England looked to be holding on for a 1-0 win. On referral, a penalty was given for a James Tarkowski foul on substitute Federico Chiesa – Insigne duly converted to equalise. Italy coach Luigi Di Biagio adopted a 4-3-3, which dropped to a 4-4-2 or 4-4-1-1 in the defensive phase. Italy pressed high up the pitch, starting with Ciro Immobile and later his replacement Andrea Belotti, followed by the two wingers – Antonio Candreva or Federico Chiesa on the right and Lorenzo Insigne on the left. The goal of their front line was to force England’s defence to play direct by discouraging them from passing to nearby players through the middle. At various stages, though, they were thwarted by England’s varied combination play. The visitors’ back line had to be very focused in front of their own goal to keep them out. England’s wide players – Kieran Trippier, Ashley Young and Danny Rose – were very active in the attacking phase. Likewise, the combinations between Jesse Lingard, Raheem Sterling and Ashley Young caused a real headache for Davide Zappacosta on the right wing. They also had various problems at defensive set-pieces, particularly corner kicks, due to the aerial dominance of their opponents. 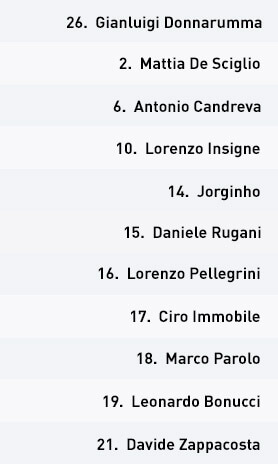 Italy opted to play the ball out from defence on most occasions. Their full-backs, Zappacosta and Mattia De Sciglio, liked to get forward. Their passes to Insigne, Candreva and Chiesa caused trouble for their opposite numbers. The intention was to work the ball around the immediate threat and find their teammates in advanced positions. The three central midfielders – Jorginho, Marco Parolo and Lorenzo Pellegrini – showed a great ability to adjust their position depending on where their team wanted to develop the attack. Jorginho operated in behind the English strikers, while the others positioned themselves behind the midfielders. Italy’s movement on the flanks was a problem for the hosts, especially on the left wing defended by Young. Full-backs De Sciglio and Zappacosta enjoyed both the time and space to threaten in wide areas, although the visitors were unable to take full advantage of this freedom. VAR took centre stage in the closing moments, when it looked like it was going to end 1-0 to England. After a James Tarkowski challenge on Chiesa was referred to VAR, the referee eventually awarded a penalty – which Insigne converted to equalise. England’s wide players – Kieran Trippier, Ashley Young and Danny Rose – were very active in the attacking phase. Likewise, the combinations between Jesse Lingard, Raheem Sterling and Young ended up causing a real headache for Davide Zappacosta on the right wing. Raheem Sterling was influential from the start. His movement and ability to draw in defenders with his dribbling caused Italy problems throughout. Italy’s full-backs, Zappacosta and Mattia De Sciglio, constantly looked to get forward. Their passes to Lorenzo Insigne, Antonio Candreva and Federico Chiesa caused problems for their opposite numbers. VAR grabbed the headlines late on, as it was after a video referral that Italy won the penalty from which they equalised. This could perhaps be viewed as a sign of things to come, with VAR set to be employed at the World Cup this summer.